I live in Thailand and I am interested in getting one of these Linksys PAP2T if I can find one here and set it up. I saw a post with the information but of course many fields are longer than the box shown on the screen so there is no way of getting all the info correctly. Does anyone know where I can get all the necessary settings before I go looking for this box. 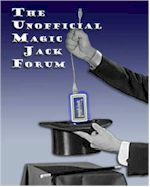 Also does anyone know if I can set up 2 magic jacks on this device as I have read that it can handle two separate numbers. Thanks for the info. Can you point me in the right direction for the iphone app and how to set it up? Also can you can 2 MJ numbers setup on an iphone? phone adapter until, MJ stopped it. That software, that I no longer have, could watch when you started up your MJ and extract the Serial Number, the A921 number that is vital to replacing a broken A921. I now have a replacement A921 but was not provided the A921 Number. I would greatly appreciate any info or tips on how to extract that iinfo.